An attractive, leather-bound Visitors Book, containing hundreds of signatures, has been shared with the Buriton Heritage Bank. 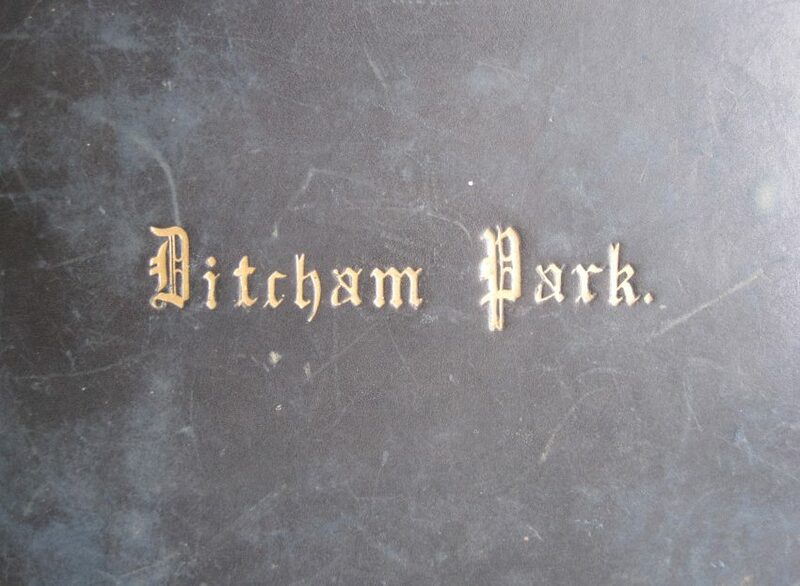 Gold lettering on the front cover show that it relates to ‘Ditcham Park’, the home of the Cave family for many years. Laurence Trent Cave bought the estate in 1885 and had a new, larger house built on the site. On the evening before the family was due to move in, the house was engulfed in flames and had to be largely demolished and rebuilt. The Visitors Book may, therefore, cover the period from the very day that the family moved in: the first entry in the book is dated August 26th 1889. Amongst the intriguing names recorded in the book are ‘John, Bishop of Portsmouth’, ‘Herbert Vaughan, Archbishop of Westminster’, Friedrich von Hugel, Arthur W Blomfield, Sydney Jolliffe, Charles Egerton Legge and Arthur Benedict Kuypers as well as frequent visits by local families and friends: Bonham Carter, Bowden, Dutton, Greenwood, Holland, Kerr, Petri, Prendergast and Talbot Ponsonby. Laurence Cave died in 1899 and the estate passed to his eldest son Captain Charles Cave. But it was not until May 1903 that Charles and his wife, Mimi, took up residence and the Visitors Book shows this temporary gap. With Charles Cave’s interests in meteorology and other sciences it appears that there are occasions when distinguished guests visited Ditcham from further afield including Chicago, Minneapolis, Washington DC, Copenhagen, Dresden, Heidelberg, Stockholm and Zurich. Visiting meteorologists and astronomers in this period prior to the First World War included Hugh Robert Mill, C L Gold, Captain HG Lyons and Aloysius Laurence Cortie. There also appears to have been a gathering of international botanists in September 1911 which included R S Adamson, Henry C Cowles, Edith Clements, Dr Oscar Drude, Carl Lindman, Dr E Rubel, A C Seward and Arthur Tansley.